Eighth graders visited the Museum of the Bible to study the impact of the Bible on the US. 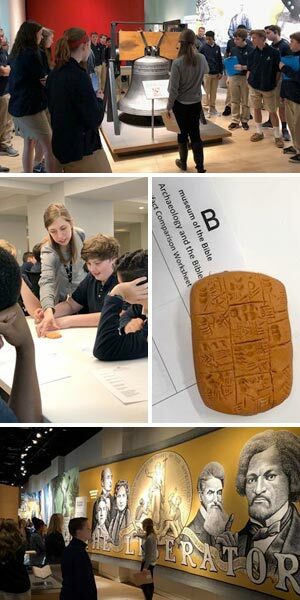 On April 4, 60 eighth graders from Annapolis Area Christian School in Annapolis, Maryland, visited the Museum of the Bible in Washington, DC, to study the foundational impact of the Bible on the United States. Students used the opportunity to prepare for their final graded discussion in history class, collecting information that would allow them to reflect on and discuss how the Bible has influenced US history, politics, and culture. Teacher Susan Leonard was a participant in the CSI Bible Symposium, held at the museum in February. Her time at the museum inspired her to organize the field trip for her students. Our trip was transformational in several ways, said Leonard. The museum helped the students see the Bible's impact in the United States and students could see the Bible is something more than personal: the Bible is about more than my family, my parents, and my church. Additionally, at this age students often view the Bible as a moral code, a way to behave to earn God's favor or solve our problems. Moralistic therapeutic deism and its ill effects are real at this age and in this generation. This trip to the Museum of the Bible taught our students the Bible isn't about morality but about influence and about a sovereign God who is at work in history and in individuals, moving creation to God's final restorative goal. Five eighth graders also had the opportunity to pilot a program for the middle school, learning how augmented reality (AR) is being used in education and specifically how it is integrated in the Museum of the Bible curriculum. AR technology allows learners to access and manipulate information in dynamic, interactive, and three-dimensional ways. For example, students used iPads to hover over an image of Noah's ark, and AR technology allowed them to manipulate the image to study the ark from all angles and learn about God's will for human beings as well as architecture and design principles. This pilot group of students will take information learned about AR and teach other eighth graders, who will use the technology to create their own three-dimensional augmented reality timelines of US history. Since the trip, students are taking the Bible's impact on culture and history seriously, said Leonard. The Bible is alive because it is God's Word, but students learned it is alive because God's Word shaped and is shaping a nation. The museum trip allowed students to gather real world evidence through hands-on learning for their final graded discussion and granted students not only a context, but a purpose and a relevance.